This occasional series focuses on members of the Frontier Fields team. It highlights the individuals, their jobs, and the paths they took to get to where they are today. Astronomer Rachael Livermore answers questions about her role on the Frontier Fields program and the path she took to get there. What does a typical day on the job entail? What are your responsibilities? There’s really no such thing as a ‘typical’ day, and that’s what makes it interesting! I travel frequently, whether to observe on ground-based telescopes, meet with collaborators, present at conferences, or give talks in other departments. My position is 100 percent research, so when I’m in the office in Austin I can spend almost all of my time analyzing data, reading and writing papers, with occasional meetings with other researchers in the department. The travel is fun but can be very tiring, so when I’m in the office I enjoy being able to put some music on and get absorbed in solving problems. What specifically is your educational background? I have a BSc in Mathematics, Physics, and Astrophysics from King’s College London, an MSc in Astronomy from the University of Sussex, and a PhD in Astronomy from Durham University, all in the UK. What particularly interested you in school or growing up? What were your favorite subjects? I was always good at math; it just came naturally and I never had to think about it too much. It didn’t interest me, though, math at school being pretty dull. It wasn’t until towards the end of high school when I started reading popular science books that introduced the more esoteric aspects of math—the nature of pi, why prime numbers are so cool, etc.—that I started to realize there was more to it than the mechanical tedium of solving equations. Math is the most fundamental thing there is, and I wish we taught more kids that. How did you first become interested in space? My mum was completely fascinated by the Moon landing, and that fascination with space must have filtered down. I remember the first time I saw the Moon through my grandfather’s telescope: seeing it as this whole other world with its hills and craters really brought home that there are entire other worlds out there. Like many people in the field, science fiction also played a huge role in feeding my interest in space. I was a voracious reader as a kid, so my mum would pick up whatever used books she could find for me at charity shops. The first science fiction book she bought me completely blew my mind: it was Nightfall, a collection of short stories by Isaac Asimov. Still one of my favorite science fiction stories! As a child, Rachael was influenced by her mother’s fascination with space. Seeing the Moon through her grandfather’s telescope was a pivotal point in her young life. Was there someone (parent, teacher, spouse, sibling, etc.) or something (book, TV show, lecture etc.) that influenced you in developing a love for what you do, or the program you’re a part of? I was not the most well-behaved kid in school, so I have to give huge kudos to my math teacher Graham Curson for recognizing I was bored and lending me the books that started to make it interesting. It was from those that I moved into reading Stephen Hawking and Brian Greene, which is what got me into physics, a subject I had never enjoyed at school. And science fiction is what drove me towards astronomy in particular. As well as Isaac Asimov, Arthur C. Clarke was a huge influence on me. They’re both very good at highlighting how so much of what we take for granted about the world (gravity, the Sun, etc.) would be so different on any other planet, and running with those ideas to talk about how these differences would affect life. When most people think of 2001: A Space Odyssey they think of the big themes of evolution and the dangers of technology. What sticks in my mind is a throwaway line in which a young girl who grew up in a low-gravity environment expressed distaste for Earth because falling down hurts. Was there a particular event (e.g. lunar landing; first Shuttle flight etc.) that particularly captured your imagination and led to life changes? I was actually an accountant for several years before I switched careers to astronomy, and while working as an accountant I was also Treasurer of the Tolkien Society in the UK. In 2005 we held a large conference celebrating the 50th anniversary of The Lord of the Rings and one of the speakers was Kristine Larsen, an astronomer, talking about Tolkien’s lunar creation myth. Meeting someone who studied space for a living really made me reevaluate my life. Two weeks later I quit my job and moved to London to start my undergraduate degree, and I haven’t looked back. How did you first get started in the space business? Unlike a lot of people in the field, I didn’t come in with a long-term plan, having started out on a whim. But when I finished my undergraduate degree I knew I had only scratched the surface, so I applied for a Masters in Astronomy. The exposure to research with real data was what got me hooked, and before I knew what was happening I was being nudged towards applying for PhDs. What do you think of the Hubble results, or the impact that Hubble has on society? I’m exactly the right age to have been young and impressionable when the first Hubble images came out, and they were mesmerizing! The exquisite quality of the images has captured the public’s imagination like nothing else, and it’s also turned out to be (by some metrics) the most scientifically productive telescope ever built. Is there a particular image or result that fascinates you? Since I work on gravitationally lensed galaxies, I think the most fascinating image is Abell 370, the first strongly lensing galaxy cluster discovered. It was discovered about 50 years after Fritz Zwicky had suggested the idea of using galaxy clusters as lenses. It was fringe science, not something anyone expected to ever be able to observe in practice. Then in the 1980s, along came sensitive CCD cameras, and there it was. The fact that it was included in the Frontier Fields means we now have really exquisite images of this incredible cluster with its famous prominent arc. The discovery of this cluster brings together so many things: a theoretical idea proving to be right, the way developments in technology drive scientific progress, and gravitational lensing itself, which is inherently fascinating. How incredible is it that the fabric of space works in such a way as to provide gigantic natural telescopes for us? Wearing an astronomically themed dress of her own creation, Rachael poses in front of a large picture of Abell 370, the first strongly lensing galaxy cluster discovered. It was the last of the Frontier Fields galaxy clusters to be imaged. Her dress is actually made up of the Frontier Fields, and the top front piece is Abell 370. Are there specific parts of the program that you’re proud to have contributed to? My main contribution has been finding the faintest, most distant galaxies. It turns out that’s really hard, because although the clusters magnify the images, you have this gigantic, super-bright cluster in the way. To find the faint background galaxies I had to develop a whole new technique for subtracting the cluster, but it turns out it works really well and I was able to find the faintest galaxies ever seen in the early Universe. What outside interests—e.g., hobbies, service, dreams, activities—could you share that would help others understand you better? I sew, and have become known for my space dresses; I’ve had several Hubble images printed on fabric and turned them into clothing – including two Hubble Frontier Fields dresses – that I wear for outreach events and at conferences. I’m also still interested in science fiction, so I make costumes for science fiction conventions, and sometimes run the conventions themselves. When I moved to the US four years ago I was excited to discover renaissance faires, which seem to be huge outdoor costume parties with jousting and fried food. In a Star Trek uniform she sewed herself, Rachael steps onto the bridge of the Starship Enterprise. Is there anything else that you think is important for readers to know about you? Since it was a public outreach talk that started my career in science, I try to pay that forward by doing a lot of outreach myself. I give talks in schools and co-founded Astronomy on Tap in Austin, Texas, which is a series of monthly talks in a bar. One of my favorite things to do is use science fiction as a hook to talk about science; I run a blog critiquing the science in Star Trek in excruciating detail, and I do regular movie screenings with the Alamo Drafthouse cinema at which I’ll analyze the scientific accuracy of the movie (some of these are on YouTube). Using popular culture as a starting point is a great way to get people thinking about science, and it’s meant I’ve been able to talk about Star Trek as part of my job, which is pretty great! You can follow Rachael on Twitter at @rhaegal. We recently finished taking data for the Hubble Frontier Fields project, and we’ve learned many very useful and exciting things, both about the universe and the objects in the images. We’ve also learned much in terms of technical issues in the images as well. The recent STScI Newsletter article by Jennifer Mack and Norman Grogin recounts much of the latter. For me, however, the most fun in projects like this is usually the beginning, with the back and forth of discussions both scientific and technical about exactly what to do and how to do it. I think it is the speculative nature and the ideas flowing back and forth in the developmental phase of programs such as this that most whets my appetite for finding what we ultimately see in the images. Having been a member of all of STScI’s internal working groups for the various community service deep field projects we have done here since the very first one, and even one of its important predecessors, it has been very interesting to me, and the most fun, to be a part of the debate, discussions, and activity involved in designing and planning these observations, and the way that process has taken place over those years. 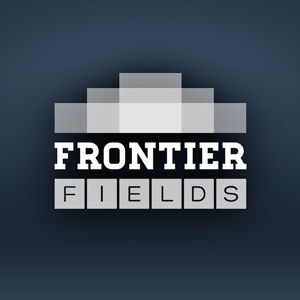 So, in this blog article, I’d like to share my own longer, and more personal context for the Frontier Fields program and those which went before. In the beginning, the Servicing Mission 1 Early Release Observations (SM1 ERO) were a demonstration of the power of the new, optically corrected Wide Field and Planetary Camera 2 (WFPC2) and Hubble combination. One of the major goals of the particular SM1 ERO program in which I was involved was simply to go as deeply as we could in 10 orbits in a redder WFPC2 filter in what, for then, was viewed as a very deep—perhaps the deepest ever—detailed, high-resolution image of the night sky. This was in the area of a cluster at a redshift of ~0.4, and a quasar beyond it in the same field of view with a possible more distant cluster around that at a redshift of ~2.055. (Quasars are incredibly bright objects thought to be powered by supermassive black holes.) This image of galaxy cluster Abell 851, or CL0939+4713, showed that Hubble and the then-new WFPC2 were superb tools for revealing the shapes of very distant galaxies in the early universe. After the first servicing mission to Hubble in December 1993, the newly installed Wide Field and Planetary Camera 2 (WFPC2) imaged the central portion of a remote cluster of galaxies called Abell 851, or CL 0939+4713. At the time this observation was taken, though only of 10 orbits depth in one filter, it was one of the deepest detailed optical images ever taken of the night sky. This observation was a precursor to and helped inspire the later Hubble Deep Fields and Frontier Fields and other similar work. Credit: Alan Dressler (Carnegie Institution) and NASA. Even with the success and revelatory power of that image, it was still viewed as a very risky thing of possibly dubious value to commit many more HST orbits and staff time and effort to try a significantly even deeper field. STScI’s then-Director Bob Williams convened a panel of community experts who debated whether such a thing should be attempted, and if so, what type of field should be targeted. The idea that something should initially be tried in a generic, nominally empty deep field eventually came to the fore, but it was still seen as a possibly big gamble that might not live up to its potential for the great amount of time required. It took a courageous decision by Williams to go ahead with the project, committing a significant portion of his Director’s Discretionary time to the project. A number of people rightly felt that they already had significant work of their own which needed pursuing and finishing and, when asked if they would be willing to take part in this original HDF experiment, declined. However, there were still some relatively few of us who had been discussing the possibilities of this informally. In my own case, having helped design and set up the SM1 ERO observations of CL0939+4713, I was eventually asked if it was technically feasible for us to even attempt such deep field observations. Some members of the original Hubble Deep Field team looking at HDF images in December 1995 or early 1996. Left to right: Ray Lucas, Richard Hook, Harry Ferguson (at computer), Marc Postman, and Hans-Martin Adorf. We performed many experiments helping to define what kinds of possibilities existed. Our experiments were, fortunately, successful, and the ultimate success of the original Hubble Deep Field ushered in a new sociological phenomenon in the field: [professional astronomical] community-service projects with high-level science products quickly released to the astronomical community, with prohibitions on internal staff use of those data and catalogs for their own scientific use for some pre-determined time. The original 1995/1996 Hubble Deep Field WFPC2 image covered a speck of the sky only about the width of a dime at 75 feet away, or a grain of sand held at arm’s length. In this small field, Hubble uncovered a bewildering assortment of thousands of galaxies at various stages of evolution. Credit: R. Williams (STScI), the Hubble Deep Field Team and NASA/ESA. In 1998, the Hubble Deep Field-South targeted a quasar with both imaging and spectroscopy, and included many more flanking fields and much deeper parallel observations—all in multiple cameras spanning wavelengths from long UV to infrared, including both the newer Space Telescope Imaging Spectrograph (STIS) and Near-Infrared Camera and Multi-Object Spectrometer (NICMOS) instruments, as well as WFPC2. Even today, I think these HDF-South observations have been underutilized, although they have now been targeted by, for example, the Multi Unit Spectroscopic Explorer (MUSE) at the Very Large Telescope (VLT) of the European Southern Observatory. This underutilization came as the community gravitated more to observations of another southern-hemisphere field, the Chandra Deep Field-South, which by then had deeper X-ray observations. Hopefully the HDF-South and its Flanking Fields will still be exploited more fully in the future. This 1998 Hubble Deep Field-South (HDF-South) WFPC2 image was similar to that of the original Hubble Deep Field (also called Hubble Deep Field-North, or HDF-North) in many ways. This was reassuring, although it was not the deepest of the images in the HDF-South. The deepest HDF-South image was actually taken by the CCD camera on the newer Space Telescope Imaging Spectrograph (STIS) instrument, and it had a quasar in the center of its field of view that was also observed with the STIS spectrograph. Other deep observations were also simultaneously obtained with the newer Near-Infrared Camera and Multi-Object Spectrograph (NICMOS) instrument, which was also installed in 1997 at the same time as STIS. A fairly deep “STIS-on-NICMOS” image was also taken on top of the area of the deep NICMOS image, and many parallel Flanking Fields were also imaged in WFPC2, STIS, and NICMOS to shallower depth. Credit: R. Williams (STScI), the HDF-S Team, and NASA/ESA. Astronauts installed the Advanced Camera for Surveys (ACS) in 2002. Under then-Director Steve Beckwith, we designed the Hubble Ultra-Deep Field (in the middle of the Chandra Deep Field-South) around use of the ACS and using WFPC2 and NICMOS in parallel, creatively making the pure parallel operational system give us the then-deepest-ever detailed UV and infrared observations. The original 2004 Hubble Ultra Deep Field, taken with the even newer, more sensitive ACS camera with a larger field of view, revealed thousands more galaxies than the earlier WFPC2 Deep Field images, in an even “deeper” core sample of the universe, cutting across billions of light-years. The snapshot includes galaxies of various distances, ages, sizes, shapes, and colors. In vibrant contrast to the rich harvest of classic spiral and elliptical galaxies, a zoo of oddball galaxies also litters the field. Some look like toothpicks or tadpoles; others like links on a bracelet. Some also appear to be interacting. These galaxies chronicle a period when the universe was still younger and more chaotic. Credit: NASA, ESA, and S. Beckwith (STScI) and the HUDF Team. Subsequent observations with ACS and the even newer WFC3 camera have given us even greater depth and wavelength coverage at higher resolution, particularly in the infrared channel of WFC3. This led to the GO program—not an STScI community service program, but done by external observers adding to the HUDF via approval by the international peer-review committees which review proposals and recommend observations to be done—called the Extreme Ultra-Deep Field. This program combined all existing archival imaging with still more new, deep infrared observations to try to look even farther back in time. All of this gives context to the observations which we have just recently finished: the Hubble Frontier Fields. Again convening a panel of community experts, and building on the success of large observing programs such as CLASH and CANDELS, STScI’s then-Director Matt Mountain explored a brilliant idea to use the gravitational lensing effect of massive galaxy clusters to magnify galaxies in the early universe beyond them, and to also provide a baseline for searches for higher-redshift supernovae. The plan was to come as close as is possible for Hubble to come to the bread-and-butter observations of the much-anticipated, soon-to-be launched James Webb Space Telescope in searching for some of the earliest galaxies in the distant, early universe. The panel recommended that a group of six galaxy clusters and six adjacent parallel fields be targeted. That was a very important development, because it also addressed in a major way a phenomenon known as cosmic variance. In this phenomenon, the large-scale structure of the universe affects observations, so that a measurement of any region of sky may differ from a measurement of a different region of sky by a considerable amount. Because the size of the fields of view of Hubble’s cameras are roughly the size of a grain of sand held at arm’s length, we’re talking about deep line-of-sight “pencil beams” in the sky when we talk about these deep fields. With the superb resolution of Hubble’s cameras, incredible detail is attained, and we can see thousands of galaxies in unprecedented detail all across their fields of view. But given what we now know about the larger-scale structure of the universe, when it comes to the matter which we can detect, at least, there are longer filaments and areas where they intersect, and voids in between. Sometimes, the small field of view of a camera may land on a filament of galaxies, and other times in a void between filaments, or partly on a filament and partly off. Therefore, the more deep fields we observe in various different places around the sky, the more we statistically beat down the perhaps unusual or anomalous statistical effects of any one particular local environment in the area of that particular deep field as we attempt to identify the more general nature of the universe across filaments and voids, etc. A major feature of the Hubble Frontier Fields program is the use of two fields in parallel, on-cluster and off-cluster, for each of the galaxy clusters targeted in the program, giving us both a cluster-centric and a generic parallel field at some much larger distance away from the cluster, for each cluster. So, in effect, we get 12 fields for the price of six. Six on-cluster fields are dominated by each galaxy cluster’s environment—something very different from a traditional deep field in terms of the physics and dynamics affecting its galaxies, and also somewhat peculiar to that cluster— and six are off-cluster, parallel fields that contain thousands of field galaxies not particularly in any cluster environment. Given the relatively small angular size of each individual parallel field, this larger number of parallel fields especially helps to minimize the effects of cosmic variance when measurements from all other similar deep fields are combined or considered together. This image illustrates the “footprints” of the Wide Field Camera 3 (WFC3) infrared detector, in red, and the visible-light Advanced Camera for Surveys (ACS), in blue. An instrument’s footprint is the area on the sky it can observe in one pointing. Adjacent observations were taken in tandem, or parallel. In six months, the cameras swapped places, with each observing the other’s previous location. When Matt Mountain’s committee recommended a study of six galaxy clusters and six parallel fields, we still had to work out which clusters to observe. Under the overall leadership of Jennifer Lotz, we conducted a trade study, a common tactic in situations such as this. Various factors about each potential cluster and their advantages and disadvantages as potential targets were examined in greater detail. We tried to keep in mind anything which might bias our selections in various ways. The number of clusters was gradually winnowed down as we discussed each of them, until we had our final six. After that, we prioritized them, planning to do an initial set, and then the remainder if a mid-course review by the external panel felt that it was warranted to continue and complete the program based on results to that time. A professional astronomical community program of improving gravitational lensing models was also put in place, with competitive proposals for grant funding to do the work and share the improved resulting models with the community. Also, having seen the power of public outreach in our other efforts, we involved those at STScI who are best at bringing our work to both the wider astronomical community and the public to allow them to help more meaningfully and widely bring our efforts to light. We also reviewed our prior experiences and policies and precedents from the various earlier deep field programs and debated whether any needed adjustment. So, now, we can also say that we’ve been lucky. The Hubble Space Telescope and the science instruments have performed well, getting us all the data we had hoped and planned to get. As we continue to work on the data, we’re now seeing the more refined versions of the Frontier Fields images which we will release to the community soon. They are indeed beautiful and interesting, and they will help the community—all of us—to better prepare for the soon-to-come James Webb Space Telescope observations. The James Webb Space Telescope is a large infrared telescope with a 6.5-meter primary mirror. Scheduled for launch in October of 2018, Webb will be the premier observatory of the next decade, serving thousands of astronomers worldwide. It will study every phase in the history of our universe, ranging from the first luminous glows after the Big Bang, to the formation of solar systems capable of supporting life on planets like Earth, to the evolution of our own solar system. This illustration shows the cold side of the James Webb Space Telescope, where the mirrors and instruments are positioned. Credit: Northrop Grumman. Webb’s much greater size than Hubble, and the much greater sensitivity of the new telescope and its detectors, will mean that Webb can make the faster exploration of more deep fields a reality. The resulting statistical advantages will give us greater confidence in the answers we find in our ongoing community studies of galaxy origins, and their formation and evolution to the forms we see in galaxies much nearer by us in space and time. It has taken a lot of work from everyone involved in our various teams of people designing and planning, implementing and scheduling the observations, and processing the data, but it has been, as with the earlier programs, a joy to see the impact spread into the community. For me, it has been one of the great privileges and honors of my many years here at STScI to have been a part of all of our various extragalactic, deep-field, community-service programs since the original Hubble Deep Field, and to have worked with so many exceptional people who have helped to conduct these programs and produce these science products for the use of the world-wide astronomical community and the public in general. Ray Lucas is a Research and Instrument Scientist at the Space Telescope Science Institute, where he has worked for about 32 years. His main interests in astronomy are interacting and merging galaxies and galaxy formation and evolution. He has been a member of all of STScI’s community service Deep Field project teams since the original Hubble Deep Field, particularly helping to work out details of the observations in the early stages. In addition to many other smaller programs on various galaxies, he has also been an investigator on a number of large galaxy survey programs like GOODS, HUDF05, and CANDELS, and other projects of his own. Aside from astronomy, among many other things, his passions include music. He plays fiddle, mandolin, and Celtic bouzouki, and some other instruments as well. Here is a link to his web page. Astronomer Gabriel Brammer answers questions about his role on the Frontier Fields program and the path he took to get there. A typical day involves a lot of communication: e-mail and teleconferencing with scientific collaborators around the U.S. and around the world, assisting observers with preparing their Hubble observations, and conversations and meetings with fellow members of the Hubble Wide Field Camera 3 instrument team. My research focuses on the formation and evolution of distant galaxies, often using Hubble observations. I have a position that allows me to pursue my own independent research interests along with my responsibilities supporting Hubble operations, and I appreciate that the goals of both of these aspects of my work are closely aligned. I obtained a bachelor’s degree in astronomy from Williams College in Williamstown, Massachusetts, and a Ph.D. in astronomy from Yale University in New Haven, Connecticut. My favorite subjects in school were always math and science, particularly physics when I was a bit older. Reading Carl Sagan’s “Cosmos” in high school always sticks with me as being a defining moment in inspiring my interest in space science and astronomy. Sagan presents such a clear connection between the beauty of the subject and the rigorous science that underlies it; I’ve seen from other profiles of my colleagues similar to this one that I’m far from alone in finding inspiration there! Was there someone (parent, teacher, spouse, sibling, etc.) or something (book, TV show, lecture, etc.) that influenced you in developing a love for what you do, or the program you’re a part of? The pursuit of an advanced degree in astronomy, or any field, is a very long chain that stretches over 20 years of a student’s life, obviously including a dramatic evolution in his or her own personal development and maturity. From day one I’m grateful for the tireless love, support, and encouragement from my parents and family, and I have had many excellent teachers, mentors, and role models at all stages of my education and career. Each of them represents a strong link in that chain, and without any one of them individually, the path I would have taken would likely have been very different from the one I am happy and honored to be on today. Was there a particular event (e.g., lunar landing, first Shuttle flight, etc.) that particularly captured your imagination and led to life changes? The bright appearance of Comet Hale-Bopp in the winter of 1997, my junior year of high school, was a formative event for me at an opportune moment. Seeing the bright comet, a transient visitor from the outer solar system, just hanging over the horizon captivated me. As often as I could, I would drag the small telescope my dad had recently bought, along with as many friends I could muster, out to the cold, dark skies of central Iowa to see it. Later in the summer of ’97, I went to New England to tour potential colleges, where, during a short visit to Williams College, I met Professor Jay M. Pasachoff and his students who were preparing an expedition to observe the solar eclipse in Aruba the following year. That brief encounter, along with the recent experience observing Hale-Bopp, showed me that studying astronomy would offer an ideal combination of research in the physical sciences and travel to exotic locales to observe both aesthetically and scientifically magnificent phenomena. I was privileged to later study and research with Professor Pasachoff myself, including an unforgettable expedition to observe the solar eclipse in Lusaka, Zambia, in 2001. Gabe checks out the telescope for observations of the June 21, 2001, total solar eclipse from Lusaka, Zambia, as part of the Williams College Eclipse Expedition. Credit: J. Pasachoff. My first experience visiting and working at a professional astronomical observatory was with the National Science Foundation’s Research Experiences for Undergraduates program at the Cerro Tololo Inter-American Observatory in 2001. I must say I was pretty miserably exhausted my first night observing up on the mountain top, ready to adjust my career plans at 4 a.m., with the local radio reminding us between cumbia (dance music) hits of the glacial progress of time — “son las cuatro con cinco minutes … son las cuatro con diez minutos.” I suppose the second night was a bit better, and by the third night I was hooked. I’ve been working at observatories ever since, now having spent something like 270 nights observing the skies from mountain tops in Arizona (Kitt Peak) and Chile (Cerros Tololo, Las Campanas, and Paranal) to valleys in Japan (Nobeyama). Going outside at night at one of these observatories and seeing the eyes of giant telescopes staring up at the sky, gathering in photons from distant objects, is an extraordinary experience. I’m happy to now have a more normal sleep schedule at the Space Telescope Science Institute, but I appreciate still being close to the day-to-day operations of Hubble as an observatory and working on the front lines as photons from distant stars and galaxies hit the detectors. A composite image of sunset and midnight at the Very Large Telescope at Cerro Paranal, Chile. Each of the four domes houses a telescope with a primary mirror 8.2 meters (26.9 feet) in diameter. Credit: Gabriel Brammer. Even classmates in my kids’ pre-kindergarten classes know Hubble when they see it! Hubble has something for everybody, from atmospheres of extra-solar planets to the most distant galaxies, and therefore has had an immeasurable impact on society’s scientific imagination and curiosity. To me the Hubble Ultra-Deep Field /eXtreme Deep Field (HUDF/XDF) represents all of the past success of Hubble and points to the future potential of Hubble and its successors like the James Webb Space Telescope in a single image. Now including near-infrared observations by the Wide Field Camera 3, installed in 2009, the HUDF/XDF shows us galaxies across some 95 percent of cosmic history, from the first star-bursting seeds of galaxies to the assembly of more massive, more regular structures of galaxies more like those we see today. The Frontier Fields represent the most recent exciting extension of the legacy begun with the Hubble Deep and Ultra-Deep Fields. The eXtreme Deep Field, or XDF, was assembled by combining 10 years of NASA Hubble Space Telescope photographs taken of a patch of sky at the center of the original Hubble Ultra Deep Field. The XDF is a small fraction of the angular diameter of the full Moon. Credit: NASA, ESA, G. Illingworth, D. Magee, and P. Oesch (University of California, Santa Cruz), R. Bouwens (Leiden University), and the HUDF09 Team. I also love browsing through Hubble’s spectacular high-resolution images of nearby galaxies. In the deep fields, we generally infer properties of galaxies based on small, barely resolved images of their structures, while images of local galaxies such as the mosaic of M82 show many of the myriad processes that form and shape galaxies in exquisite detail. It is through the combination of these resolved nearby studies and distant surveys that Hubble has made such a large contribution in our understanding of how galaxies form and evolve. I am happy to have helped make the Frontier Fields observations as deep and as efficient as possible to maximize the scientific return from extremely valuable observing time on Hubble. With only a relatively minor change to the observing strategy, taking extra care to avoid extra glare from bright foreground light from the Earth, we enabled the Frontier Fields to see ever fainter and more distant galaxies than otherwise would have been possible. Photo taken by Gabe of Comet Lovejoy (C/2011 W3) and the European Southern Observatory’s Very Large Telescope at Cerro Paranal, Chile (December 22, 2011). Credit: Gabriel Brammer. Tricia Royle, senior program coordinator, answers questions about her role on the Frontier Fields program and the path she took to get there. When astronomers are granted time on Hubble, their program is assigned to a program coordinator to make sure the observations are feasible and schedulable on the telescope. When problems occur any time between acceptance and execution, it’s the program coordinator who helps get problems resolved. We act as liaisons between the various groups at the Space Telescope Science Institute (STScI) — science, operations, scheduling — and the observers — principal investigators and co-investigators. I tend toward the large-scale and long-term observations like Frontier Fields. I have a BSc in physics and astronomy from York University in Toronto, Ontario, Canada, and I have taken postgraduate courses in applied physics from Johns Hopkins University in Baltimore, Maryland. I wasn’t particularly good at school in the early years and didn’t like the monotony of memorizing multiplication tables or writing out spelling words. In grade six, when the curriculum started to get interesting and turn more logic-based, I started to pay attention and actually enjoyed just about every class — except history, which still had too much memory work. In high school, it became clear that math and science were my favorites, though I still took a lot of English and arts courses because I enjoyed the creativity involved. Growing up in a very rural area about an hour outside of Toronto, surrounded by farms and no streetlights, I had always been able to see the Milky Way, but I didn’t know much about what I was seeing. When I first read that our sun was a star and figured out that meant every star I was seeing was potentially someone else’s “sun,” it was pretty humbling. I wasn’t very old and I’m pretty sure I annoyed a lot of aunts and uncles with my new-found “discovery” that our sun is actually a star. I didn’t understand how they could talk about anything else if they knew how many suns there were in the sky! Weather and gas prices just didn’t seem important enough to warrant discussion when compared to my new sun/star revelation. Was there someone or something that influenced you in developing a love for what you do, or the program you’re a part of? Was there a particular event that especially captured your imagination and led to life changes? A lot of things happened when I was in my pre-teens and teenage years to push me toward space. I remember feeling intense sadness and disbelief after the Challenger disaster. I was in middle school, just starting to enjoy learning, and had a hard time dealing with the idea that a teacher who was supposed to go into space, then come back to share her experience with her classroom and other classrooms, now wasn’t coming back at all. I hadn’t realized before then how dangerous it was to launch a shuttle and couldn’t see past the loss of those seven astronauts to understand why anyone would take that risk. A year or so later, Star Trek: The Next Generation came on TV, and it all started to make sense. I loved the scientific language and ideas in the show and the notion of “going where no one had gone before.” Traveling around on the Enterprise seemed like a dream come true, and I started to understand why someone would put everything at risk to go into space. Star Trek: The Next Generation was my first exposure to positive science fiction — not just doomsday aliens and robots — and it introduced me to the concept of just how much more might be out there and what might be possible. Hubble launched a few years after that, when I was in high school, and started sending back incredible images of real things that were actually out there, waiting to be found. It seemed to me that maybe a bit of the show was coming to life and I wanted to know more. When it came time to choose a topic for my first high school term paper — it happened to be advanced chemistry — I decided it was a good excuse to find out more about all those suns/stars I had seen in the sky as a child, on Star Trek for the past four or five seasons and now coming down from Hubble. This seemed like a really good idea until my 10-page report was closer to 30 pages, and I still had several books to go through. Thankfully, I had a wonderful chemistry teacher who encouraged me to delve as deep as I wanted into the topic, but to choose something specific to keep the final paper under 15 pages so she could finish reading it in an evening. I chose to focus on the life cycle of stars, and that was the beginning of my intense curiosity about the science of space and the universe. On a later trip, 21-year-old Tricia poses at the entrance to Kennedy Space Center. The summer after my third year at York University, I worked with Dr. John Caldwell analyzing Hubble data on the low-mass stellar companions of larger stars. During that summer, he visited STScI and Johns Hopkins University to attend a conference and meet with his collaborators. I was invited to tag along. I imagine I looked a little — or a lot — lost and awkward standing among seasoned Hubble scientists and STScI employees in the auditorium after a talk. Fortunately, one of the Hubble data analysts took pity on me and invited me into her conversation. Lisa Frattare — now part of Hubble Heritage — became an instant friend and would later encourage me to apply to work at STScI after graduation. I didn’t take her seriously, thinking there was no way a fresh-out-of-school job could be with something as huge as Hubble. But on a dare with one of my college roommates, we both applied for our unattainable dream jobs — I applied to STScI and he applied for a coaching job at the University of Hawaii. As luck would have it, I got an interview and came to work at STScI shortly after graduation as a program coordinator. Sadly, my roommate did not make it out to Hawaii. Before I left York University, Dr. Caldwell described my new position at STScI as “the hot seat of astronomy,” which ended up being an understatement. Immediately after I started, I was working with and attending conferences with scientists I’d seen listed in textbooks. In my first two years, I had the opportunity to work with the Director of STScI — Robert Williams — and many others on the Hubble Deep Field to push the science limits of the telescope, and to join Lisa Frattare and Keith Noll on the Hubble Heritage Project to help make beautiful images from Hubble’s scientific data. I worked with Hubble Heritage for five years and still think it is one of those really great initiatives that highlights for everyone, not just scientists, what Hubble can do. All in all, not a bad start to a career in space. I think people have started to take for granted the amazing images Hubble continues to allow scientists to take. It’s been up there for almost 26 years, which means there are a lot of kids and even adults who don’t know what it’s like to NOT have these observations sent down on a regular basis, or what it was like before Hubble helped solve some of the fundamental questions about the expansion of the universe and what is out there. I have two school-aged kids who just assume that Hubble has or will answer any question they may have about stars or galaxies. I don’t think it occurs to them that Hubble hasn’t always been and won’t always be around to do that. The fact that it is such an ingrained part of the scientific and academic community says just how successful it has become. It’s like the Internet – it’s hard to remember what it was like before we had this way to find answers to our questions. I suspect Hubble’s archives and legacy programs will continue to provide answers, or trigger new questions, for a long time yet. The Ultra Deep Field, or UDF. I found out I was pregnant with my first child just after I started working as program coordinator for the UDF, and the UDF images were released while I was still in the hospital after delivering my daughter — so I will forever tie those two events together. But more than that, I still use the UDF image in my presentations, even though it is almost 12 years old, because it fascinates everyone who learns what they are really looking at. I ask people to look at that image and realize that what they are seeing aren’t individual stars, but galaxies. Then I ask them to keep in mind that this particular piece of sky was chosen because it was “boring,” and to further consider that everything they are seeing is contained within a patch of sky the size of the president’s eye on a dime, held at arm’s length. More than a few jaws drop at the implication. Seeing the UDF image triggers that realization in people, especially kids, of just how vast the universe must be easily makes the UDF my favorite. Are there specific parts of the program that you’re especially proud to have contributed to? I like the view from where I sit in Operations. I like watching a Hubble program develop from the initial science outline in the Phase 1, to a workable Phase 2, to a successfully executed set of observations. I especially love the large and multi-cycle programs — 47 Tuc, Hubble Deep Field, Ultra Deep Field, Andromeda, CANDELS, and now Frontier Fields. They allow me to work with people who have such a passion for what they do on these in-depth programs and challenge me to find new ways to get them the science they need. Because repeat observers are assigned, when possible, to the same program coordinator each time they observe, that working relationship has a chance to grow cycle after cycle. Program coordinators tend to get very attached to the scientists they work with multiple times. I’ve been here since Cycle 6 and now we’re ramping up for Cycle 24, so the list of observers I claim as mine is pretty long, and I feel very protective of them and their observations, even if they’ve moved on to other program coordinators or even other telescopes. What outside interests could you share that would help others understand you better? A lot of what we do on Hubble can feel abstract and intangible, since we can’t actually go to the telescope or out in space to touch what we observe — so I like to do things that produce more tangible, immediate results. In addition to my love of reading and watching sci-fi TV shows, I do a lot of crafts to create something I can hold in my hand. With most of my observers scattered around the country and internationally, I rarely see them in person. Giving talks about Hubble to schools and the more general public lets me connect the science to people. Being able to explain a Hubble image to someone without a science background and make it real for them, helps put into perspective that what I do at work on a daily basis can be inspiring and has results beyond the image itself. I want what we do at STScI and on Hubble to show people they can dream as big as they like because the universe is big enough to handle it. I was one of only four female physics and astronomy majors in my first year at York University. Before classes even started, my academic advisor suggested that I might want to choose something easier than physics and astronomy, despite coming in with an A+ average in high school and scoring in the top 5 percent on the math assessment. Male classmates with B averages were not given the same suggestion to find an easier major. In the years ahead, every test grade of mine that fell below an A – there weren’t many – brought up the question from others, and myself, as to whether I really should be there, whether I was good enough. It was a constant fight to prove to classmates, professors and myself that I deserved to major in physics and astronomy. It wasn’t enough that I wanted to be there and was passing my courses – I had to excel. Four of us started, but I was the only female graduate in physics and astronomy in my year. I have a daughter and a son, still relatively young, but they’re starting to look at what they want to do when they finish school. Obviously I want them to do well, but my wish for both of them, and anyone else looking at what to do in their life, is that in whatever field they choose, they know that wanting to be there is enough and they don’t have to prove to anyone they deserve to follow their dreams. 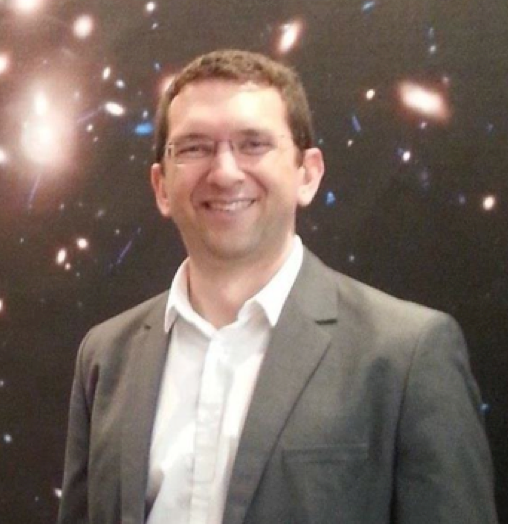 Dan Coe, ESA/AURA Astronomer, in front of the first Frontier Fields image, Abell 2744. What is your position? What are your responsibilities? I am an ESA/AURA astronomer at the Space Telescope Science Institute (STScI) in Baltimore. I use gravitational lensing to search for distant galaxies in Hubble and Spitzer Space Telescope images. I am the gravitational lens model coordinator for the Frontier Fields program. I also work to support astronomers’ use of Hubble’s Advanced Camera for Surveys and the Near-Infrared Camera on the upcoming James Webb Space Telescope. How did you get involved with the Frontier Fields program? In 2012, working on the Cluster Lensing And Supernova survey with Hubble (CLASH), I discovered a candidate for the most distant galaxy yet known, MACS0647-JD. Its light took about 13.4 billion years to get here, so we see it as it was long ago. We are looking 97 percent of the way back to the Big Bang. Back then, galaxies were much smaller, just 1 percent the size of our Milky Way, and had yet to form grand spiral structures. MACS0647-JD is more distant than any of the galaxies discovered in the Hubble Ultra Deep Field (UDF), even though Hubble stared at the UDF for much longer: a week vs. four hours for the infrared images. This demonstrates the power of gravitational lensing. Galaxy clusters enable us to see fainter light from galaxies in the distant universe. Gravitational lensing had been used often by astronomers, but its power had yet to be fully exploited. No one had taken ultra-deep images of a galaxy cluster with Hubble or Spitzer. I advocated for this to a committee convened by former STScI Director Matt Mountain. And now it has become a reality in the Frontier Fields program led by Jennifer Lotz. The ultra-deep images of galaxy clusters are revealing the faintest galaxies ever studied, magnified by gravitational lensing. How do astronomers study gravitationally lensed galaxies? The distant galaxies in these images are most typically magnified by factors of between 2 and 10. To properly study these galaxies, we need estimates of their magnifications from gravitational lens modeling. By studying the observed deflections and distortions of background galaxies, astronomers build up a model of each galaxy cluster’s mass distribution (primarily dark matter) and the resulting lensing magnifications. For the Frontier Fields, five groups of astronomers from around the world collaborated to gather the best possible data on all six clusters and produce gravitational lensing models. I coordinated these efforts and processed their model submissions for all astronomers to use. This lens modeling work is unprecedented both for its collaborative nature and the accessibility that all astronomers now have to the magnification estimates. With deep Frontier Fields imaging now in hand, astronomers are able to study the lensing in much more detail and are producing the best dark matter maps and lensing models ever. I helped Jennifer Lotz select the six Frontier Fields clusters—with a lot of input from other astronomers. I had hoped my babies would do well! So far they have, and I am proud. Left: Frontier Fields Hubble image of Pandora’s Cluster, Abell 2744. 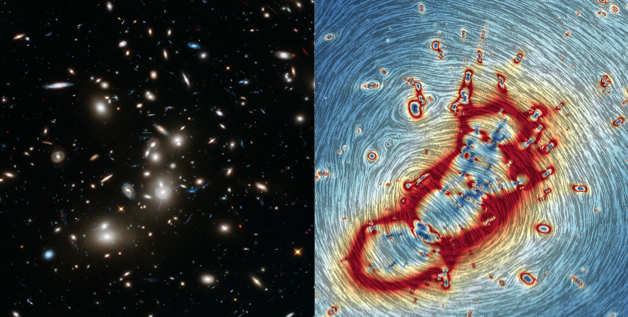 Right: Lensing magnifications (color) and distortions (swirls) of distant galaxies according to one model produced by Johan Richard and the “CATS” (Clusters As Telescopes) team. Mom was a space geek, as she tells it. She can still name the Mercury Seven [NASA’s first astronaut class]. She drew celestial bodies on the ceiling above my crib and hung a poster of Van Gogh’s “Starry Night” on my wall. She sat me on her lap to watch Carl Sagan’s “Cosmos” and to read the companion book. She took me outside to enjoy eclipses and meteor showers. And she held me in her arms and cried on my head as we watched the first Shuttle launch. I remember always being awestruck by the immensity of the universe. And I knew I wanted to work on everything. 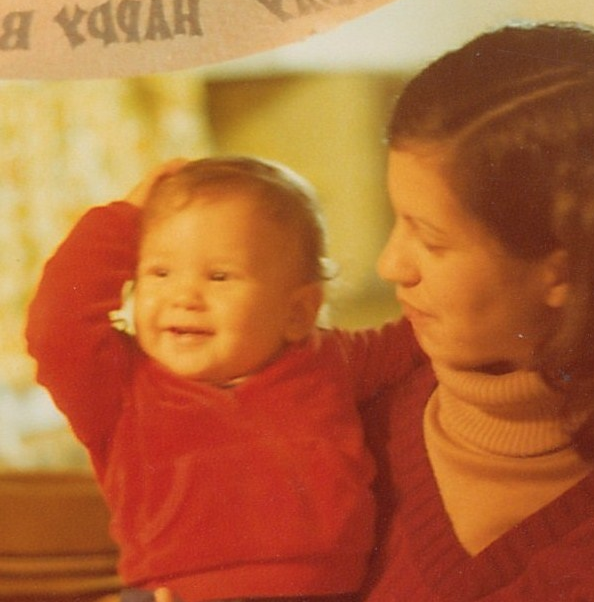 This picture of Dan and his mom was taken when the future astronomer was just 5 months old. I went to Browne Academy elementary school, Thomas Jefferson High School for Science and Technology, Cornell University for my B.S. in Applied & Engineering Physics—with a concentration in astrophysics—and Johns Hopkins University, right across the street from STScI, for my Ph.D. in astronomy. Growing up, I loved math, puzzles, games, and eventually computer programming. The latter proved especially useful for my career since we write many programs to analyze our Hubble images and other data. “What about poetry?” Mom would ask. She and my father had studied art, literature, and history. As a smart-aleck kid, I insisted all of that could be explained by mathematics. But as I grew up, I grew to appreciate the poetry in Carl Sagan’s explanations of our universe. I became more curious about all of the physical and personal forces that brought us to where we are and take us where we are going. And all of this, in time to meet my partner Kate Welch, a Shakespeare scholar, who gives me a deeper appreciation for both poetry and history. Turns out I should have listened to my mother all along! I followed Carl Sagan to Cornell, but unfortunately I never got to meet him. He was too sick to teach my freshman year. During my senior year, astronomers announced new supernova results suggesting the existence of dark energy. Carl Sagan had taught us we are all made of star stuff. But then we learned that the universe is mostly made of something very different: dark matter and dark energy. Astronomy had humbled humanity yet again. I think I always planned to go to grad school for astronomy, but those exciting results really sealed it for me. Once in grad school at Johns Hopkins, my advisor Narciso Benitez started me working on mapping dark matter in galaxy clusters by modeling gravitational lensing, and measuring distances to galaxies in new Hubble ACS images, including the UDF. He was a constant source of inspiration as I tackled tough analysis problems. I followed him to Granada, Spain, where I finished my Johns Hopkins Ph.D.
After three years at NASA’s Jet Propulsion Laboratory and Caltech in Pasadena, I am now back in Baltimore at STScI. My colleagues and I here are fortunate to work with Adam Riess, one of the Nobel Prize winners from that inspiring dark energy discovery in 1998. I am proud to be contributing a small part to Hubble’s great legacy. In addition to my Frontier Fields work, I am leading a large new Hubble program called RELICS to observe 41 more lensing galaxy clusters. Complementary to the Frontier Fields, RELICS is casting a broader net with shallower imaging. Our goal is to find the best and brightest distant galaxy candidates for more detailed study with current telescopes and with the James Webb Space Telescope. Hubble has filled us with wonder and taken us back in time, almost all the way back to the Big Bang. By flipping through Hubble’s scrapbook, we can relive 97 percent of the history of the universe. James Webb will tell the tale of our cosmic origins in the first galaxies. I can’t say I really comprehend the immensity of the universe any more than I did as a child. But I have appreciated new details, and I remain awestruck. The universe teaches us to be humble yet proud, and most of all, I think, grateful. Humble, as an insignificant speck in the vast cosmos. Proud that we have come so far and can begin to comprehend it. And grateful that we have the privilege to witness and explore so much of it. Dan calls this picture of the Carina Nebula “the most beautiful astronomy image I’ve seen.” This 50-light-year-wide view of the nebula’s central region shows a maelstrom of star birth and death. The mosaic was assembled from 48 frames taken with Hubble’s Advanced Camera for Surveys, with information added from the Cerro Tololo Inter-American Observatory in Chile. When I was around 10, my father and I started playing duplicate bridge at a local club on Saturdays. Many of the other partnerships would argue with one another over their play, but not us. Dad and I did our best, celebrated our good plays, and learned from our mistakes, but never got angry with one another. My parents’ unwavering support, pride, encouragement, and engagement of my curiosity have made me the astronomer I am today. I do my best to keep making them proud. 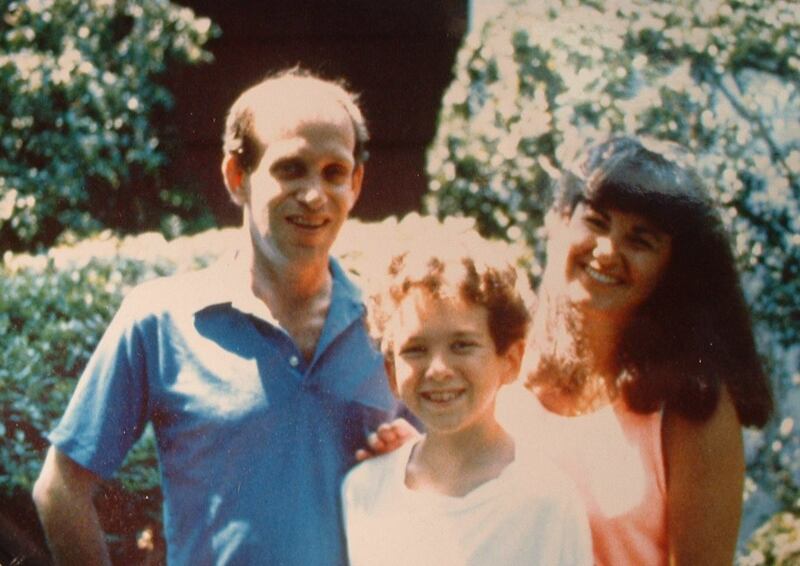 Dan, at the age of 11, poses with his dad and mom. I feel very fortunate to be paid to do what I love. And I have been privileged. Like many others at STScI, I work hard and try to give back in small part by sharing the rich history of our universe with others in Baltimore and with people around the world. I hope you enjoy hearing our stories. Jennifer Mack, a Hubble Research and Instrument Scientist, answers questions about her role on the Frontier Fields project. My formal title is Research & Instrument Scientist in Hubble Space Telescope’s Instruments Division. I help manage the Frontier Fields data pipeline, which delivers the best possible calibrated data products to the astronomical community. I am also part of the WFC3 [Wide Field Camera 3] Instrument team where I work on calibration of the UVIS [ultraviolet and visible light] and IR [infrared light] detectors. What is a “data pipeline” and what does it mean to “calibrate”? A data pipeline is a set of software for processing and combining sets of images. It includes tools to correct for instrument artifacts, such as bad pixels, thermal signal from the detectors, and variations in sensitivity across the field of view. The goal of calibration is to tie the brightness of objects measured in Hubble’s cameras to some absolute system, based on measurements of stars of known brightness. The data pipeline team keeps an eye on the Frontier Fields images as they are arriving from the telescope. For a given cluster, these come in a steady stream over a period of about 6 weeks, so we have to keep on top of things. First and foremost we need to be sure that the telescope was pointing in the right place and that it was stable throughout the exposure. We also develop software to correct the images for artifacts that aren’t automatically handled by Hubble’s standard calibration pipeline. This includes masking out artifacts like satellite trails or scattered light from bright stars. We also mask IR ‘persistence’ which is leftover signal from very bright objects in observations taken just prior to ours. For the IR detector, we correct the images for stray light, usually from the bright Earth, that varies with time over the course of an exposure. For the ACS [Advanced Camera for Surveys] detector, we correct for artifacts like hot pixels and charge transfer losses during readout, both of which are considerable after being in space for 13 years. Once that is complete, we correct the images for distortion and align them. These are then stacked together to create full-depth mosaics for each filter using specialized software called AstroDrizzle which allows us to optimize the resolution of the final images. What specifically is your background? I have a BS in physics and an MS in astrophysics. I’ve been at Space Telescope since 1996, and over the years have helped calibrate Hubble’s main imaging cameras: WFPC2 [Wide-Field Planetary Camera 2], ACS, and now WFC3. I was particularly interested in science and math in high school. I remember in physics class we had to predict the landing spot of a marble rolled down an inclined plane and off of the side of a table. Measuring only the height of the incline, the height of the table, and the time the marble was in the air, we were able to calculate where on the floor the marble would land and then put a paper cup there to catch it. I was amazed that this actually worked and was struck by the power of mathematics to predict events which seemed like magic to me. My birthday coincides with the peak of the Perseid meteor shower. This is a particularly spectacular event in southwest Colorado where I grew up, and when I was little I asked my mom if the meteors were special for my birthday. She cleverly told me that they must be, and that felt very magical to me. When I got older, friends and I would hike to the top of a mountain and lay back to get a full view of the night sky. As the meteors streaked across the sky, we would imagine that we were clinging to the side of the Earth, spinning at 1000 miles/hour, and trying not float away into space. Growing up under really dark skies really sparked my curiosity about space and made me think about all the mysteries still undiscovered. When I was young, I asked a lot of questions and especially wanted to understand how and why things worked. My parents never said “I don’t know,” but took the time to show me how to find answers, either in books or on the computer. We watched a lot of nature documentaries together, including the original Cosmos series which resulted in a lot of interesting discussions. My parents really listened to my questions and as a result instilled in me a general curiosity and love of learning. Is there a particular image or result that especially fascinates you? I’ve always been fascinated by galaxy clusters, and the Frontier Fields images are pushing the limits of HST’s instruments to the extreme. By combining very deep exposures with the power of a gravitational lens, we are able to look back even further in time to view galaxies when the Universe was only 500 million years old. When you create very deep images like these, limitations in the current instrument calibration become apparent. We are developing new techniques to do cutting-edge calibration and sharing these new methods with the user community in the hope of allowing for the best possible science with HST. It’s exciting to be a part of all this new discovery! Are there specific parts of the program that you’re particularly proud to have contributed to? In addition to my Frontier Fields work, I’m proud to be a member of the Hubble Heritage Team, which produces some of the most iconic astronomy images ever. These images are designed specifically for the purpose of inspiring people, and I think that is an especially worthy pursuit! My specialty is in understanding Hubble’s instruments, and I work on designing the observations and also in calibrating and aligning the images once they have been acquired. Some recent mosaics I’ve had the pleasure of working on include hits like the Eagle Nebula, Westerlund 2, the Monkey Head Nebula, and the Horsehead Nebula. Jennifer Mack enjoying time in Colorado with her son.